Jan 1st, 2016 — San Francisco based Raise the Bar Fitness aims to attract new members by offering a discounted Fitbod subscription with a new gym membership. Fitbod further plans to measure the impact of virtual personal training on membership retention. 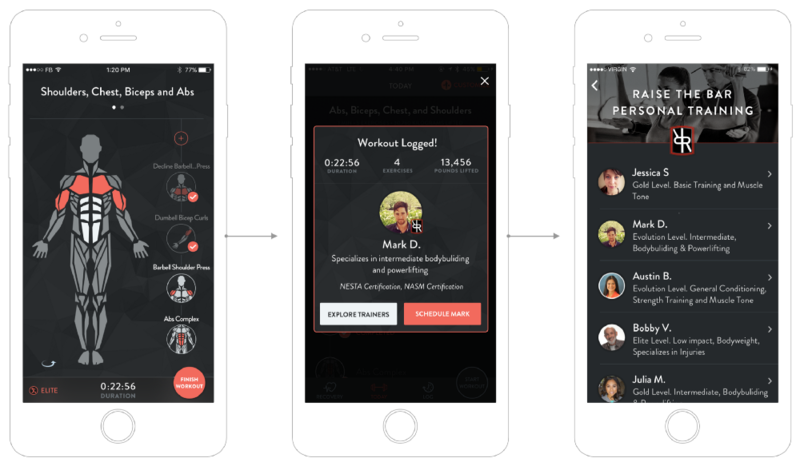 Additionally, gym-goers will be able to shop Raise the Bar’s bench of personal trainers when additional help or motivation is needed — all through the app. I’m excited to see how fitbod will change the gym experience for both our gym members and personal training clients. We hope the app will allow us to better target gym services members. Just finished a few sets of deadlifts? Fitbod will show you the trainers who specialize in that exericse. Fitbod leads in smart fitness guidance. Products in this space offer personalized workout & nutrition plans that are computer created, using predictive analytics and machine learning. With this tech, Fitbod builds custom fit exercise routines that understand your strength-training ability and evolve as you make progress. Current leaders in Health & Fitness sell fixed exercise plans, compiled by human editors, expensive to create and difficult to adapt to unique fitness needs. In July 2016, Apple featured Fitbod under “New Apps we Love” and “Plan & Log” within the Health & Fitness category. Since launching in Sept 2015, Fitbod ranks in the top grossing Health & Fitness apps. Today, users log over 250,000 exercises per week from personalized workout plans created by Fitbod’s automated workout builder. Raise the Bar Fitness is a private personal training studio in San Francisco for trainers, clients and general members. All trainers working out of Raise the Bar Fitness are certified by a major health organization, independently insured, and AED and CPR certified.